Arriving in Krakentown with their enemies in hot pursuit, Zenobia doesn’t know how they can even hope to win. Being terrified brings forth an undeniable truth: she loves Ariq and will do whatever it takes to stand by him. I'm assuming that if you're reading this, you've read the first 7 parts (but not necessarily this part, so no spoilers for that here). And finally, we get to the end! I must confess that, though I'm writing this review a couple of weeks after that for part 7, I wasn't able to wait quite as long as I'd planned in between installments. Part 7 left things at quite an intriguing point, and after some 4 days, I gave in. I don't want to give too much away here. Suffice it to say that we get our final confrontation here, and it's fantastic. It's a clever, if still dangerous, plan and the execution made complete sense. It was also incredibly cinematic. There was a point where I was sitting there open-mouthed, as some truly awesome (in the formal sense of the word) scenes played out in my mind. And the romance. Ahhhh! We're almost there when we start this, but the final step, the final acceptance of each other here, it was really sweet. I closed the book with a happy sigh. So, I loved the story itself, but a big element with this one was how well the serial format would work for me. In the end, the results were mixed. On the positive side, I liked the pause for thought in between installments. I actually did find myself thinking about the story in those periods, and the story might have felt fresher each time because of them. The catching up was seamless, with each installment starting with a letter from Zenobia to her brother that was much more than "...and this is what's happened in the last few days." I loved those, they were lovely. There were also some really unobtrusive bits during the text itself. That all worked beautifully, and I wouldn't expect it to be clunky (or even noticeable) for those who are planning to read the book in one go when it comes out later in the year. I also never got annoyed by being left hanging, mainly because I wasn't. The breaks came at places which felt like natural stopping points. There would be unresolved overall things, but each part felt self-contained and we'd get small resolutions in each. It felt like a well-done television series, in that respect. On the negative side it's all about the mechanics. Reading one installment a week requires you to be in the right mood for that kind of story every week. Much as I love Meljean's books, sometimes I'm in the mood for adventure romance, sometimes I'm not. Also, I would obviously read other stuff in between episodes and would normally be in the middle of another book when the next part came out. 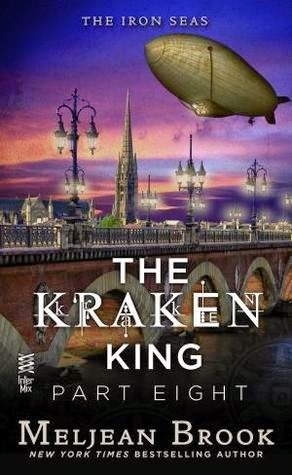 Mostly I'd happily put that down for a couple of hours to read the new episode of The Kraken King, but sometimes I didn't want to. That's what happened when I was on holiday in Italy. I'd just started The Goblin King on the flight there. That is a fantastic book which I just didn't want to put down. I didn't have much time to read anyway, but when I did, The Goblin King it was. So yeah, in summary, I found real life interfering much more with my reading rhythm with a serial format than it would have with a regular novel. Would I try the format again soon? Yes, but my position hasn't changed much from before I started this. I'd said I'd try a serial if it was by a trusted author and not simply a regular book chopped into roughly equal parts, and that hasn't changed.